I downloaded and ran 1.16a. It works like a charm. No errors, no slowdown, no problems with the toolpath visibility button. I clicked it on and off many times. 1.16a ran as fast or better than 1.14a. Here are my testing results. I overlayed the 1.15a DLL files with the 1.14a DLL files. It ran much better but still not quite as fast as 1.14a by itself. It was close though. The slowness seemed to come and go when dealing with the toolpath screen. When not on the toolpath screen the hybrid install seems to run very well. Also when I turned off the toolpath view (the eye icon). Things sped up. One other item, after a few times of turning the toolpath viewing on/off, the eye icon would turn green but the toolpaths would not go away. No matter how many times I clicked it or how long I waited between clicks, the toolpaths would persist. Overall, I'd say that the hybrid install ran within 85% of the 1.14a install. Here is my log for your viewing pleasure. I’ll try that and let you know. I have a question...When you say “SVG support”, what does that mean? Importing SVG / Exporting SVG / Something else? First I rebooted my machine, running Windows 10. A MS update was queued and installed when I rebooted. Then I opened Google Chrome and loaded up some websites that I keep open. 1. Ran 1.15a. Still very slow. Things worked and nothing locked up but sometimes I had to wait for responses from menu clicks and cursor movements. This seems to be from program start till I closed it. 2. Ran 1.14a that you uploaded. Ran like a champ. No slowness, no waiting on menu clicks or cursor movements. This was even true when I loaded my test image and went through the steps to generate the gcode. 3. I deleted the current install of 1.15a, reinstalled 1.14a then loaded 1.15a over the top. Response was very good till I loaded the test image. Things slowed down but not as bad as in testing scenario 1. I was able to utilize the software but had to wait for some menu clicks and cursor movements to catch up. In a nutshell, this install ran much better than the first 1.15a install but not nearly as fast as 1.14a. Below is my current log file. I hope this helps. I ran the same image I've been using to test PCNC through the new version. I'm not even going to try to list the issue, but in general I had error boxes pop up and close the program, very slow response when moving between steps and eventually the software locked up and I had to kill it. This happened several times. I'm just going to attached the log file and let you figure it out. Still happy with the software and direction you are heading. I'll post them as I find them. - Crop tool. Sometimes an image is loaded that has too much border around it. 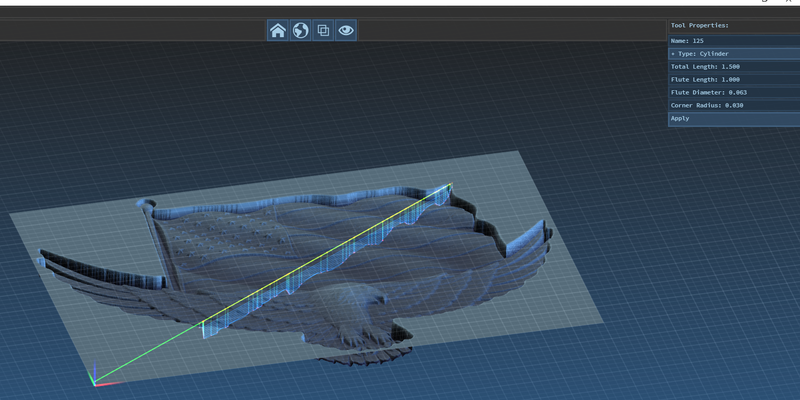 You could open the image in an image editing package but if you cloud just draw a box or a free form draw tool in PCNC to crop, that would be nice. - When you change the z-depth in the image dimension area, if the max depth in Operation Properties exceeds it, then automatically reduce this value to the z-depth. Thanks bud! I saw your reply and understand. I look forward to the next version and will keep testing. I did some additional testing. The PCNC seems to start acting flakey whenever I lower the flute diameter to .063 (or below .125). When I do that with direction "Mixed" I get a toolpath like this screenshot. If I change it back to :"Conventional" then I get the error message shown in the previous reply. When I changed to Mixed direction, I started to get weird results. First I got a cut path that was one single line going from the bottom left to the top right. Then I started to get error messages no matter what I chose. I've attached a screen shot of the the error and I'm going to include the log file. 40.055 [ ERROR ] con_append: src contour has no polylines! 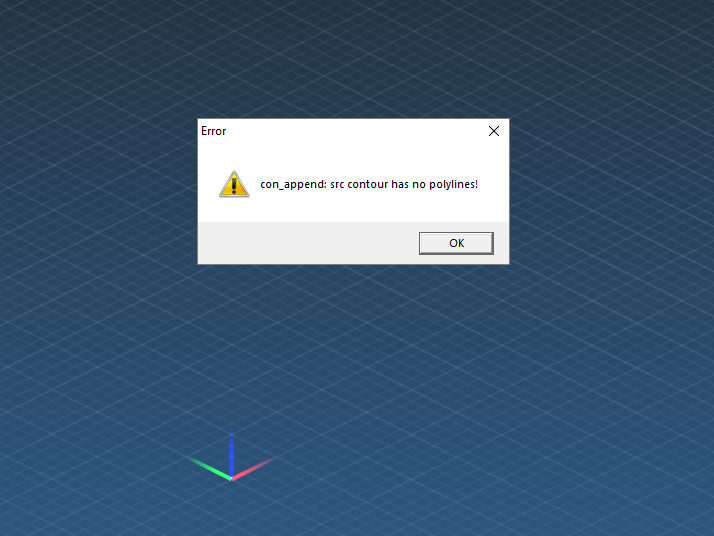 209.234 [ ERROR ] con_append: src contour has no polylines! Thanks bud! I figured it was something I had not setup correctly. I'm running a test carve of a the eagle file we worked on last week. I'm using the "pink" foam so I can cut fairly fast. I noticed that the carve is only cutting in one direction. I'm attaching a video so you can see what I mean. It cuts then lifts, returns to the left then cuts left to right again. It may be that I did not setup the gcode properly but how do I get it to cut in both directions? I’ve been testing PCNC on a laptop without a numeric keypad. When I loaded it on my work machine and tried to use the numeric keypad to enter image dimensions and other data, it would not input. I had to use the numbers above the keyboard. First off, simple question...Do you go by Charlie or Charles? I understand what you are doing with the tweaking. Currently, the program speed is not problematic at all so I think you can go for increasing sub division and other tweaks at the expense of speed. Waiting for items to render is much preferable to not having clean conversions. Maybe, at some point, putting in a time estimate for render would keep folks from thinking that the program has locked up. I spotted the invert option issue and was going to add it to the issues list. No need now. This next suggestion is from my perspective, others may have a different opinion. What you described with the way you tweaked the picture is nice but I am a just a basic Photoshop user. I know enough to be really dangerous. I had already played with the contrast/brightness but the gradient thing is outside my knowledge level at the moment. The more that you can do to make PCNC handle the adjustments without having to use 3rd party software is better. To make the product better and adoption by users easier, they will want to load, adjust, output and carve. Thanks for the hard work. Looking forward to getting my hands on the new version. 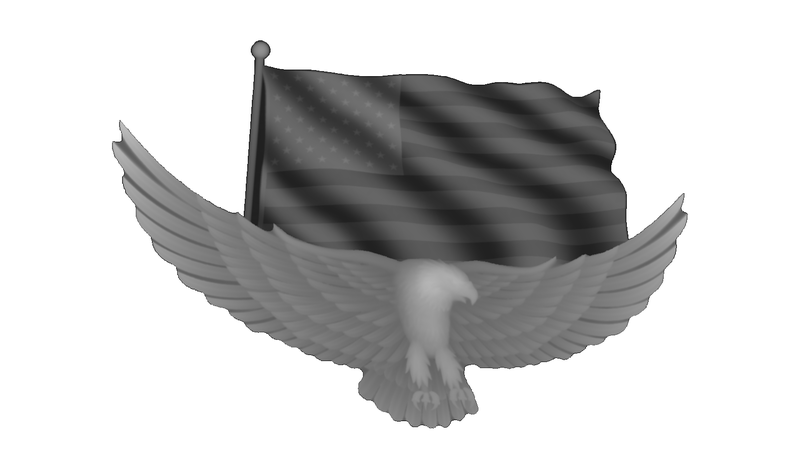 Here is an image that I convert from a .STL image to a .PNG. I would be curious to see what setting you would use to get the best output from PCNC. When I tried using PCNC with this image, the tool paths seems to be a little rough. I tried with a 1/8" endmill, .05 setover at both .25 and .50 max depth. Milling operations did not save name between projects. I just purchased PixelCNC and will start to test some images. I really like the concept and the work you've done so far. I was just about to ask you for an invert feature and 'boom' it showed up in the next version. Do you want us to continue to post bugs, suggestions and enhancements here in this forum or do you have an email you can provide? I am having the same issue as Bill. The GUI will load but it locks up everytime I try to load an image, a very small image. I've been watching your product page since your announcement. I was waiting for you to release a version other than 1.0a before I pulled the trigger. I noticed that you have released 1.1a but removed the special price. Well, I downloaded the new version and tried to load a 170x170 image. It has been stuck in "generating parallel milling operation" for over 15 minutes. Stuff like this is why I was waiting for another release to purchase and am leary to purchase at $100. This was nothing special. 60 ipm, .125 endmill, .05 step, .06 doc. I had to kill the product in task manager. It tried another image and same thing. I cannot get it to work if I change any of the default settings. I also noticed that any naming that I do for the cutting and milling operations I create do not stick. If I can get 1.1a to work properly and you re-instated the special price, I would be in for purchasing. I like the product, a lot, but just waiting for a release beyond the first to join in.